Few days ago we found out about this trending and popular app that everybody are using and have fun. The app is called Tuurnt and it is one of the best iOS apps in the Photo & Video category. It has amazing design and wonderful, fun features which are fully accepted and positively acclaimed from its customers, according to the huge amount of reviews we've read. Tuurnt is an app that actually gives the appropriate meaning of the word "social media". Every other social media site allows only posting comments, photos and videos, but doesn't really let you participate in all that fun. Well, know it is possible. 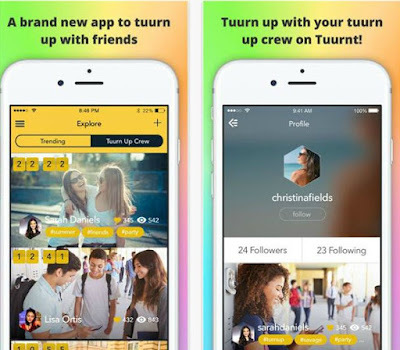 Making a profile on Tuurnt will offer you the most authentic feature ever - to be a part of your friends' tuurn up videos and have fun together. All you do is connect or attach your stuff and create a video sequence which you can share, leave a comment or like it. You have 24 hours to reply to a photo or a video once it's posted by some of your friends. Your life time experiences and memorable moments are now starting with Tuurnt. Keep up with the currently trending tuurnt videos and keep yourself entertained every day. Tuurn up with your tuurn up crew on Tuurnt with downloading it from the App Store, free of charge.